It wasn't technically a heart attack, though she called it that. It was a crisis in her long battle with congestive heart failure and chronic pulmonary disease that hit her like a sledgehammer one day in June 2016. An ambulance was called to take her to the hospital. The two former presidents who had been at home with her that day, her husband and her oldest son, trailed in a car driven by the Secret Service. The tumultuous presidential campaign in general and Trump's ridicule of son Jeb Bush in particular had riled her. "Angst," she told me. "There's just a lot of angst" among those distressed by President Trump's leadership, Jeb Bush told me, using the same word that his mother had used. "So I think one of the solutions is don't watch it; don't obsess." 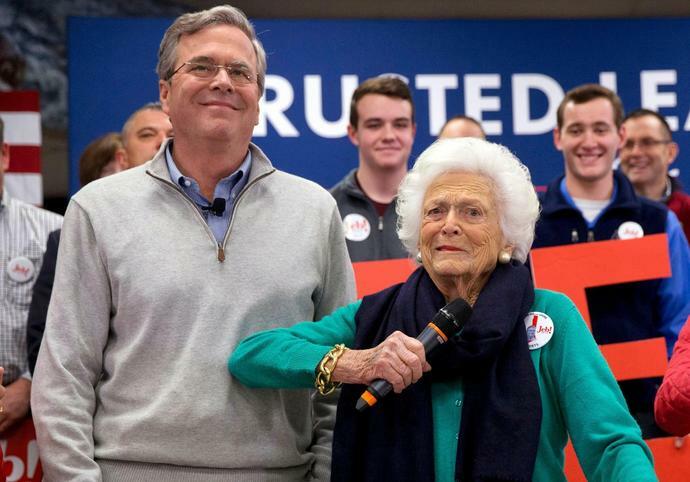 "Jeb said, 'Mom, don't worry about things you can't do anything about,' " Barbara Bush recalled. "He's right. Just do good, make life better for someone else." "I'm trying not to think about it," she said in an interview as the first anniversary of Trump's election approached. "We're a strong country, and I think it will all work out." Even so, she was dismayed by the nation's divisions and by the direction of the party she had worked for, and for so long. That was a stunning acknowledgment. Barbara Bush had been one of the most recognizable faces of the Republican Party through two presidencies. She was the matriarch of one of the GOP's leading families. But after Trump's rise, she saw it as a party she could not continue to support, a party she no longer recognized - even as one of her grandsons, George P. Bush, was on the ballot as a Republican running for re-election as Texas land commissioner. She returned to New Hampshire, the state that had rescued the elder George Bush's presidential prospects in 1988, to campaign once again. This time, she was 90 years old and using a walker. She pushed it through a New Hampshire snowstorm as she went from event to diner to interview. "I love my son, and I know that America needs him," she said in an interview on "CBS This Morning" three days before the primary, sitting side by side with him. "He's honest, dependable, loyal, relatively funny, good-looking" - she elbowed him good-naturedly - "but funny. He's got the same values that America seems to have lost. He's almost too polite. I don't advise him, but if I gave him advice, I would say, 'Why don't you interrupt like the other people do?' And he does not brag like some people we know." She refused to say Trump's name, but there was no mistaking whom she meant. "I'm not getting into a spitting match with him," she said. "He can spit further than I can." Anchor Norah O'Donnell noted that Trump had ridiculed Jeb Bush for deploying his mother in the campaign. "Just watched Jeb's ad where he desperately needed mommy to help him," Trump tweeted. "Jeb-mom cannot help you with ISIS, the Chinese or with Putin." "Putin endorsed him, for heaven's sake," Barbara Bush erupted. "Putin the killer! Putin the worst! He endorsed Trump! That's an endorsement you don't want." Trump won the New Hampshire primary. Jeb Bush finished a disappointing fourth. When he did no better in the South Carolina primary 11 days later, he decided to end his campaign. He called his mother. "I just want to let you know I'm heading home," he told her. "I love you," she said. Nothing more. Barbara Bush's negative opinion of Trump dated back decades. "The real symbol of greed in the 80s," she wrote in her diary in January 1990. She had just read a news story about Trump addressing a Los Angeles charity gala, an awards dinner for Merv Griffin hosted by the American Friends of the Hebrew University and attended by Ronald and Nancy Reagan. Trump had needled the former president for the high-priced speeches he delivered in Japan. "I see President and Mrs. Reagan in the audience. Did you have to pay them $2 million?" A month later, she saved news clippings to show a friend about Trump's separation from his first wife, Ivana. Their divorce would be finalized in 1992. She noted that Ivana's allies said the $25 million settlement in the prenuptial agreement she signed wasn't enough. "The Trumps are a new word, both of them," she wrote. "Trump now means Greed, selfishness and ugly. So sad." Trump had made a weird overture to George Bush in 1988, when Bush was poised to clinch the Republican presidential nomination. In his biography of George Bush, "Destiny and Power," historian Jon Meacham reported that Trump told campaign strategist Lee Atwater that he was available to be Bush's running mate. Writing in his diary, Bush dismissed the idea as "strange and unbelievable." More than a quarter-century later, Barbara Bush couldn't quite imagine that Trump was going to win the White House on his own. "I don't understand why people are for him," she said in one interview. In another, she expressed astonishment that women could support him. George Bush ended up voting for Hillary Clinton, the first time in his life that he had cast a ballot for a Democrat for president. Barbara Bush wrote in Jeb's name on the last day of early voting. "I could not vote for Trump or Clinton," she wrote in her diary. Barbara Bush's original judgment, made three and a half years earlier, seemed prescient. "There are other people out there that are very qualified, and we've had enough Bushes," Bush declared on NBC's "Today" show in April 2013, amid speculation about whether Jeb was going to run. The country apparently did feel there had been enough Bushes, and enough Clintons, in high office. Jeb Bush lost the Republican nomination. Hillary Clinton won the Democratic nomination but lost the general election, trailing Trump in the Electoral College, though she carried the popular vote. "I think people didn't want anybody who was in office," Barbara Bush told me. "I think they wanted a whole new world." The morning after the election, George H.W. Bush, honoring the traditions of the office, called the president-elect to offer his congratulations. Trump "was very nice," Barbara Bush wrote in her diary. "He said that George was a great president and he admired us both. He said Jeb was strong and a great man. He is trying ... at this moment ... to be conciliatory. He says he wants to represent all the people." Bush also wrote a personal note to Karen Pence on the Christmas card she sent her and her husband, Vice President-elect Mike Pence, soon after the election. "I really wanted to write you earlier to tell you how much fun I had as the wife of the VP," she told her. "It is a lovely house." Those weren't the letters Bush had expected to write after the 2016 election. She had drafted a funny congratulatory letter to send to Bill Clinton - assuming that he would take over the role of presidential spouse. "It said, 'Welcome to the First Ladies Club,' " she told me. " 'We can't wait to initiate you.' " She never mailed it. "I woke up and discovered, to my horror, that Trump had won." She didn't hide her horror from those close to her. After Trump was elected, a friend in Kennebunkport gave her a Trump countdown clock as a joke. The red, white, and blue digital clock displayed how many days, hours, minutes and seconds remained in Trump's term. She parked it on the side table in her bedroom, next to the chair she would sit in to needlepoint or watch television.